Some threats to the energy sector are macro in nature and affect all other sectors in much the same way, including economic and political volatility. But others are industry-specific, as many energy businesses worry about the regulatory climate in which they operate. Political uncertainty (42%) and economic volatility, cited by a quarter of fast-growing energy companies, provide a worrying backdrop for the sector. Businesses considering significant investments or to incorporate renewables into their value proposition are doing so on shifting sands. The uncertainties are multiplying, from the rise of protectionism to the increasingly divergent monetary policy outlook. Meanwhile, these businesses are also worried by technological change, with 19% citing it as a potential threat to growth. This is a double-headed risk: not only are fast-growing energy companies hoping to reorient their business models with technology – where the danger of misstep is clear – but they also face the threat of disruption from competitors powered by new technologies, including new entrants to the sector. As an industry that supplies a public utility, the regulatory imperative is a constant for these businesses, but the pace of legislative change in recent years has added to the pressure. With that in mind, regulatory risks are seen as the biggest threat to growth. 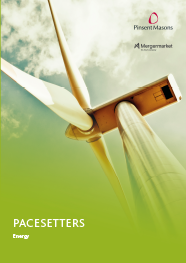 Almost half (46%) of fast-growing energy businesses cite these as a main challenge. More than half the fast-growing companies in this research pick out environmental regulation (55%) as the area where the challenge has been greatest over the past three years – the same number expect this to continue to be the case over the next three years. As governments across Europe struggle to meet their carbon emission targets, the continent’s energy businesses will continue to feel the pressure. Public awareness about climate change is increasing and the energy industry is adjusting to the fact that consumers and regulators want a more decarbonised world – though fossil fuels will likely remain a part of the energy mix for quite some time. Traditional operators, such as oil and gas companies, are working out where they will be in coming years and moving into new areas, including renewable energy. Labour and employment is the other area where fast-growing companies are challenged by legal or regulatory risk: 42% of the businesses in this research pick out this area as likely to be problematic over the next three years, a notable jump on the 19% that have had such difficulties over the previous three years. Overall, these potential threats are giving many companies pause for thought, says the CFO of a Spanish energy firm, particularly when it comes to dealmaking: “Political upheaval and regulatory conditions have made us more reluctant in our approach towards M&A”. Fast-growing energy companies worry about how to cope with these uncertainties as they shift into renewables. On the one hand, some governments are offering generous incentives and subsidies to encourage competition in this marketplace and businesses to explore these new opportunities. On the other, the availability of such support is skewing valuations in the sector. The majority (82%) of fast-growing energy companies complain that regulatory change – including both incentives for renewables and disincentives for traditional energy businesses – have inflated asset prices in the alternative energy space. Some 71% complain that competition for these assets has been elevated by regulatory interventions. Still, many fast-growing energy companies are pushing on in their pursuit of growth: 67% cite increased opportunities for medium to long-term investment in renewables being created by regulatory change.